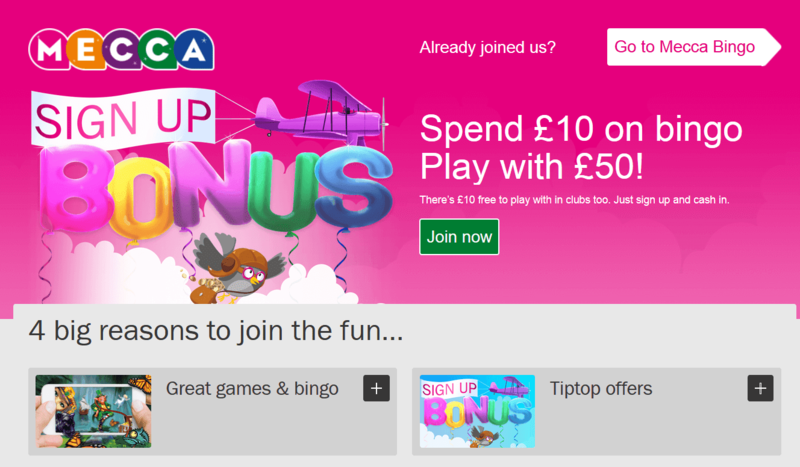 Mecca Bingo Review 2019 - Sign-up for £50 Bonus Today! Visit Mecca Bingo Get Your Bonus! Mecca Bingo is a legitimate online casino expressly for players in the UK, Ireland, and Gibraltar that is certified to be safe and secure. Fully licensed and regulated in Gibraltar and Great Britain. Licensed by the British Gambling Commission Mecca Bingo also promotes responsible gambling and the software is licensed by the Government of Gibraltar and regulated by the Gibraltar Gambling Commissioner. Fast, Reliable Withdrawals ? All legitimate, real-money poker sites like Mecca Bingo have strict anti-fraud screens, and that may create a short withdrawal delay. £10 to use in any Mecca Club ? Second deposit:	Deposit £5 or more and bet £10 on selected slot games and get a	£10 cash bonus you can withdraw immediately. If you live in the UK and are a big bingo fan, the name Mecca Bingo probably needs no introduction. Maybe you have already played at one or more of the Mecca Bingo clubs all over the country. Now you don’t have to wait for when your busy schedule permits you to get over to one of the clubs to play in person. You can play bingo, along with some of your favourite casino games, online on your computer or on the go on your mobile phone or tablet anytime you wish. If you have never heard of Mecca Bingo, but are looking for a reliable online bingo room and casino with quality games where you don’t have to bet big money, you should consider this place, too. One of the features that makes the Mecca website a standout is that it is not some newcomer that you would be taking a chance on, but one of the most trusted gambling brands in the UK. It would be very hard to fault a company with more than 50 years in the gambling business. The fact that MeccaBingo.com is being run by the prestigious Rank Group and powered by continually updated Virtue Fusion software further assures you that they are in tune with and responsive to what today’s demanding online customers want. On the other hand, Mecca Bingo is not for everyone. For starters, it is only open to players in the UK, Ireland, and Gibraltar, so if you live outside of these jurisdictions, you will not be able to register on this site and play for real money. If you are a high roller, you won’t be turned away, and if you want to make bets of up to £1,000 on blackjack or roulette, you can. But keeping in mind that Mecca Bingo is primarily a bingo and low stakes gambling site, you would probably fare better at a casino that offers a VIP program that recognizes and generously rewards high-end players. Selecting a reliable online casino is never easy, but you will rarely go wrong if you use longevity as a yardstick. As already mentioned, Mecca Bingo excels on that count, boasting more than a half century of experience servicing the multifaceted needs of online casino players in the UK, much like yourself. There is no way the company would have been able to stay in business all of these years and maintain its excellent reputation if were running a site that was less than secure and fair. While the site’s impeccable track record could be reason enough to place your trust in it, you have another reason in the fact that this site has not just one licence to operate, but two, both from jurisdictions with very strict requirements. The original licence is from the Alderney Gaming Commission. The additional licence is from the UK Gambling Commission. Recent changes in UK gambling laws now make such a licence a requirement for any foreign based site being able to continue to operate in your country. This is for your own protection. You can be sure that if there was anything suspect about Mecca Bingo, the second licence to operate in the UK would have been denied. Player privacy and security is a number 1 priority at Mecca Bingo All personal information and financial transactions are kept completely secure and private and protected by the latest encryption technology available. In addition, while thoroughly perusing this site in order to prepare this Mecca Bingo and casino review, we were very impressed with the in depth information included in the lobby. Everything you need to know about every game is outlined for you in clear, easy-to-understand terms, including full disclosure of the rules and return to player (RTP). Mecca Bingo is powered by Virtue Fusion software, a highly regarded provider that is used by many online gambling websites. Virtue Fusion specialises in bingo software but also provides a platform for slots and selected other games. This is ideal for operations like this Mecca online gambling site, which cater primarily to bingo players but wish to diversify and offer their players a wider range of betting options. The following are a few of the advantages that the Virtue Fusion software offers you as a Meccabingo.com player. All of the games are instantly available in flash version. No need to download any software onto your computer. Either a PC or Mac is fine. Wide variety of bingo games, with something for everyone. Convenient customisable options. For example, you can zoom to make your cards easier to read. You can also customise sounds. You can even customise the shape and colour of your bingo dauber. Play in up to 4 rooms simultaneously and view all your cards on one screen. Take part in online chat rooms and make new friends. Option to purchase bingo tickets in advance. Not just bingo, but a wide choice of side games, including slots, table games, instant win games, and scratch cards. Any quality online UK casino that has done its homework is aware that there are very few of you online players out there who do not own a smartphone. The very fact that you are not running off to the casinos and clubs every day to play, but playing online when you can squeeze in the time suggests that you need a casino that will adapt to your own hectic schedule. If that schedule includes being on the go a lot, there will be times when you want to play, but don’t have Internet access. But as long as you have your smartphone or tablet and the place you want to play has a mobile platform, your favourite bingo and casino games are ready when you are, in the palm of your hand. All too often, mobile customers are disappointed that the apps being offered by their favourite online casino fail to measure up to the quality they were expecting. After all, what good is an app that only offers a handful of games, won’t let you access any of the benefits that computer players get or, even worse, won’t even support play on your mobile device? Mecca mobile casino and bingo players don’t have those problems. In fact, Mecca Bingo won the 2014 WhichBingo award for Best Mobile Bingo Experience. In order to play bingo, slots, or casino games, simply visit www.meccabingo.com on your mobile. Play bingo on your phone or tablet and play slots and other casino games, too. Mecca Bingo apps - You can download the Mecca Bingo app onto your iPhone, iPad, iPod Touch, or Android phone and play the same 90 Ball Bingo game you would online for the same shot at huge prizes and jackpots. Apple iOS iPhone, IPad, and iPod Touch users can download the app using the code provided on the Mecca Bingo website or on the App Store. Android users can use the code for the Android app provided on the website. If you own an iPad, iPhone, iPod Touch, or Android mobile device, the popular game, Cashline, is another bingo game you can play for real money using your existing Mecca casino and bingo online account. Another app, for iPad, iPhone, and iPod Touch users only, lets you play the fun game, Bin-glo for free. Mecca Casino apps - If you want to play Mecca casino games on your smartphone or tablet, no problem. Simply visit www.meccabingo.com on your Apple iOS, Android, or Blackberry mobile and log on with your existing account. As of this writing, the most options, 40 games in all, are available if you have an iPad and all but one are also available on your iPhone or iPod Touch. You can enjoy a choice of 29 or 30 action-packed Mecca slot games, 4 video poker games, blackjack and multi-hand blackjack, classic and European roulette, and 2 scratch card games. Among the slots, you can try your luck on familiar favourites like Cleopatra, Rainbow Riches, and the London-themed Big Ben, or perhaps step up the action with Treasure of Troy with 40 paylines and 1024 additional ways to win! Or take a shot at the huge progressive jackpots in Clover Rollover, Leprechaun’s Luck, or The X Factor. If you own an Android smartphone or tablet, you can play too. Choose from 28 exciting games, including 19 slots, 4 video poker games, blackjack, classic and European roulette, and 2 scratch cards. Only five games are optimised for Blackberry mobile play, but they include the progressive slots, Leprechaun’s Luck and The X Factor. We’ll be honest in this Mecca Casino review. This is not a casino that is going to hand out a big fat bonus in return for signing up as a new player and agreeing to deposit and play a large sum of money. 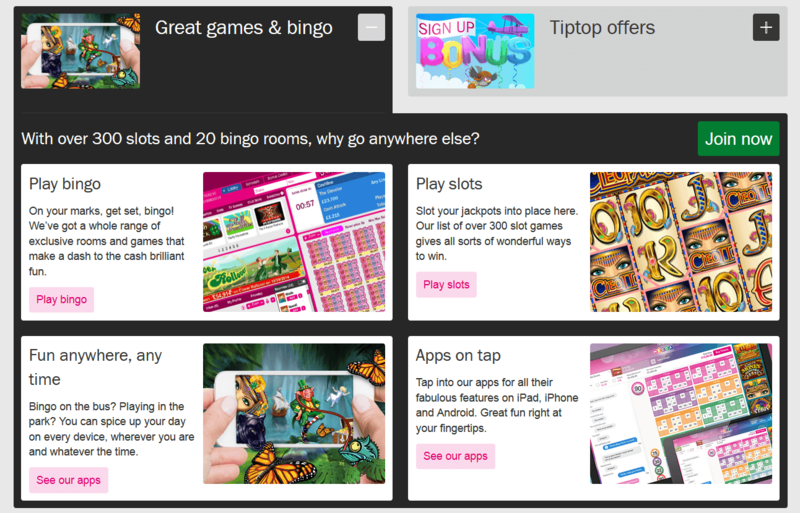 In fact, at Meccabingo.com, whether your first deposit is £10 or £1000 does not matter one iota. Your Welcome Bonus is still the same: £50, which by online casino standards is not much. However, the amount of play that is required of you in return to benefit from the bonus is minimal. You do have to bet your own £10 first on bingo. But as soon as you do, you receive an additional £30 in free bingo bets, another £10 to bet on the casino game of your choice, and another £10 you can use to bet in any Mecca Club. Mecca Bingo offers another bonus upon making your second deposit, which can be as little as £5, and then betting £10 on selected super slots games. You then receive £10 in bonus funds, which is withdrawable immediately. If you are a high roller, we agree that the two-part Mecca Bingo Welcome Bonus won’t cut it. But otherwise, contrary to what you might think, this is a good bonus because it gives you excellent value for your money. Most online casinos won’t even accept an opening deposit of just £10. Or, if they do, they would give you a £10 bonus, not a £50 bonus, and then probably require about £500 in slot play before you could withdraw either the bonus or your winnings. Not as many banking methods are available to you as Mecca Bingo, as at some online gambling sites. But considering that this is a UK casino, rather than an international one, this finding is not surprising. There are still enough options available that most players should not have a problem, and for your convenience, GBP is the preferred form of currency. We were somewhat surprised, however, given how forthcoming Mecca Bingo is otherwise, that the website is not more informative with regard to banking. For example, we did could not find any statement about which deposit methods could be used for withdrawal or what the maximum withdrawal is (the minimum is £10). According to other online reports, the average processing time is 48 hours, which is very reasonable if, in fact, that information is correct. Or, to get your money even faster, instead of cashing out online, you also have the option to make withdrawals at any Mecca Club. You need to call 0800 032 0500 ahead of time to arrange to collect your winnings. You are permitted one withdrawal per day at the clubs, from £10 minimum to £100 maximum, and during the hours of 10:30 a.m. to 9 p.m. only. Whatever method you decide upon for your banking needs, you have nothing to worry about. You are dealing with a website that takes every necessary precaution to protect the security and privacy of your account. You can also contact Customer Support anytime if you have you have any questions or concerns. Despite the name, Mecca Bingo is not just a place to play bingo. While bingo clearly rules and Mecca Bingo is your mecca for every bingo variation you have heard of, and probably many more that are brand new to you, there are plenty of other games, too. There are 317 games in all, and to help you decide, they are listed in the lobby both alphabetically and by category. We will start by telling you about the Mecca slots; then we will move on to the two most popular casino table games, roulette and blackjack. These slots are based on popular TV shows like the X Factor, Who Wants to be a Millionaire, Britain’s Got Talent, and Deal or No Deal. The website does not state what this large and very diverse group of slots has in common, possibly their presence in land-based casinos. You will find some instantly recognisable titles, like Zeus and Cluedo, among them. Some of these games have fixed jackpots, while others feature a progressive jackpot. Either way, there is big money waiting to be won. If your favourite slots are the ones that are filled with extra features like bonus rounds, free spins, shooting and colossal wilds, and other surprises, and you like lots of action and excitement in your slot games, these games are for you. These are the games with huge progressive jackpots, where one lucky spin can turn a player into an instant multimillionaire. What is especially nice about the Mecca slots is that instead of simply picking a game at random and hoping you like it, as soon as a particular game grabs your attention, you can click on the corresponding icon in the lobby and read all about it Also, before risking a cent of your own money, you can try it out in play money mode to get the feel of it. The Mecca Casino offers several different variations of European Roulette. All of these games have a single zero wheel with a 2.73% (and in two of the variations, slightly lower) house edge. This is the traditional form of the game. Take your roulette play to the next level with extra features to enhance your online gaming experience like advanced betting options and comprehensive history displays (in case you like to look for winning number patterns). Pinball Roulette is played like regular roulette except that instead of the dealer spinning a wheel to see where the ball lands, the ball flies around a pinball game. This game gives you more ways to win with three wheels spinning for you at once. You can also try for an optional colour up bonus. Real interaction with dealers and players was one feature of playing in real brick and mortar casinos that was initially always missing in online casinos, and still often is, but not in Mecca Bingo live roulette. While playing this game with a real dealer from the UK, the experience is so much like being in a regular casino, you may have to remind yourself that you are still playing on online. Considering that this is primarily a bingo site, we were expecting that if blackjack was being offered at all, that the game would have mediocre rules. But we were pleasantly surprised to discover otherwise. One variation is actually far superior to any blackjack games you are likely to find in a land-based casino. But forget about card counting. The cards are reshuffled after every hand! This is a standard blackjack game with 6 decks. The dealer stands on soft 17, doubling down is permitted on any two cards, and pairs can be split once with doubling after splits. Bet size is from £1 to £1000. What makes the game special is the modern interface, “intuitive controls,” and “optimized positioning.” The game has a house edge of .40. Every time you play bingo at Mecca Bingo, you earn Play Points. Then, when you accumulate enough points, you can redeem them for cash or for gifts in the Play Point Shop. Unfortunately, none of the other games count. You only receive points for your bingo play. In addition, Mecca Bingo has five Play Point levels: Pink, Orange, Green, Blue, and Violet (VIP). In order to advance to a higher level and maintain that level, you need to have earned a specified minimum number of points the preceding month. The higher your level, the more bonus points you receive in addition. Depending on your level, there are other rewards, too, including some or all of the following: double points, match play, free bingo, drawings for prizes, and a birthday bonus. You can check your points balance and level in the lobby. Every 1,000 points is worth £1 in cashback. If you are new to the site and to bingo, this is as good a place as any to get an introduction to the game. During your first week of play, you can try the games for free from 12 to 1 p.m. and 6 to 8 p.m. daily. There is £20 up for grabs in each game. However, any winnings get placed in your bingo bonus balance and must be spent on bingo. Players also receive free tickets for the Friday night £1000 bingo games. If your friend joins and plays £10 or more, you receive £20. You can invite up to 10 friends each month and possibly receive an extra £200 per month just for your referrals! Friendsy Saturdays:	Have your friends join you for a bingo party. If any questions or problems arise, Customer Support is on hand to help you. You can contact them via live chat, phone, or email. Note that phone support is only available from 8 a.m. to midnight. Join Mecca Bingo today and get a bonus up to £50!